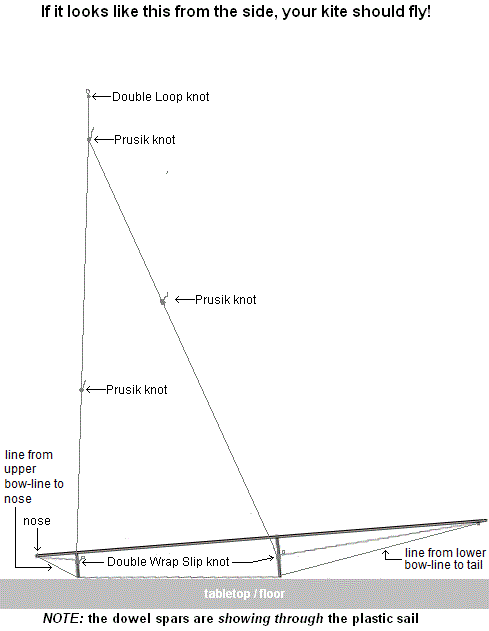 To keep the bowed horizontal spars from flopping back down to the sail, they need to be tethered with short loops of flying line. These can be seen in the diagram above, near the table-top. Make a big loop from a length of flying line, by tying the 2 ends into a Multi-Strand Simple Knot. The loop should stretch from the center of the upper bow-line to the top of the vertical spar, with plenty of length to spare so you can tie it off. See the top photo. Attach the loop with a Lark's Head Knot to the bow-line, directly over the vertical spar or close to it. Wrap the other end of the loop around the corner strap a couple of times and tie off with a single Half Hitch so it's easy to undo. 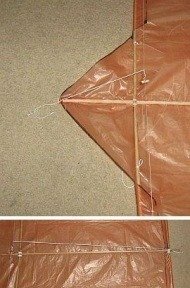 Make another loop for the tail end of the kite. 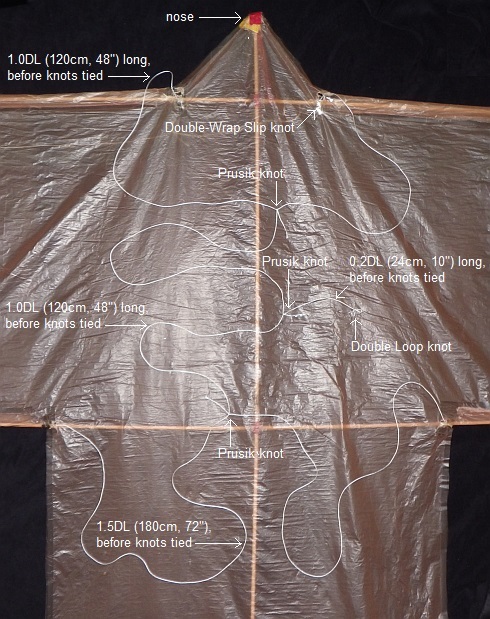 The loop should stretch from the center of the lower bow-line to the bottom shoe-lace tie on the vertical spar. See the bottom photo. Simply place the other end of the loop over the tip of the vertical spar, so it slips back up to where the shoe-lace tie is. If the length is a little too long, just tie another Simple Knot near the first one until you get the length right. Note: These loops stay attached to the bow lines from now on.